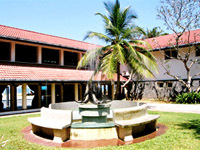 Hotel Address:Emerald Bay Hotel, Yalegama, Induruwa, Sri Lanka. Located just 67km from Colombo, the Emerald Bay is Packed with all amenities. Unwind in view of the spellbinding Indian Ocean. Give your senses a soothing treat - experience the mind, body and soul enriching properties of Ayurveda. More awaits you but one thing is for sure a breezy holiday is surely guaranteed! South of colombo, Located just 67km from Colombo. Enjoy a buffet meal at the air-conditioned restaurant,a set menu from the bar or order as you wish and dine on the terrace. Address Emerald Bay Hotel, Yalegama, Induruwa, Sri Lanka.